Are you contemplating of upgrading to a gas range or gas dryer? Are you thinking of installing a gas fireplace so you can enjoy the comfort and ambiance of a warm crackling fire on a cold winter night? Plumbing 911 can help. Our highly trained team of plumbers are certified and qualified to take on plumbing jobs of all types. Contrary to popular belief, plumbing doesn’t always involve water. Many times, it involves gas, gas lines and water lines. There are many risks when running gas lines into your home. A Buckeye Rooter will never take these potential life threatening risks lightly. A gas leak is a very serious situation that needs immediate attention. If you smell gas in your home, quickly leave and call Plumbing 911 from a neighbour’s home. Gas line leaks are very dangerous and need the attention of a highly trained certified & licensed professional. Be safe!! 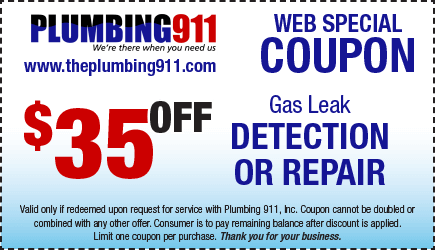 Call Plumbing 911 today and have your gas lines inspected for leaks and potential needed repairs. Our licensed plumbers are certified to work on all gas line repairs. No matter what your gas leak problem may be. We will locate and provide proper gas line repairs to make certain your gas lines are leak free and in top condition. Do Not ignore your gas leak or attempt to make the repairs yourself. This is a dangerous situation that requires a true professional. For the very best in gas leak detection and resolution, call Plumbing 911 today!